the exciting experience, more enjoy your riding.The FDCVB support FM function and is suitable for most of the helmets on the market. ① Support hands-free call,enjoying clear stereo music. ② You can listen to the voice prompt of GPS navigations by bluetooth wirelessly. ③ Providing convenient and safe communication with your teammates while riding. ④ Professional Intercom meet all the communication and entertainment needs of your ride. ⑤ TCOM-SC is suitable for most of the Bluetooth device such as smartphone,MP3,GPS and so on. 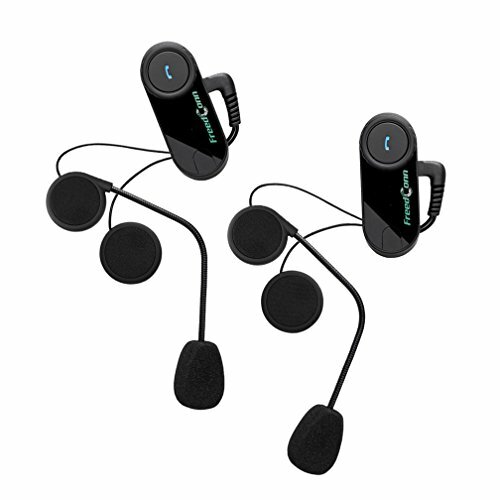 ★2-3 Riders: Support 3 riders to pair and 2 riders intercom at the same time, allows maximum of 800m direct full-duplex intercom distance and up to 120km/h working speed.The LCD screen can display a wealth of information, such as Phone number, FM channel, etc. ★Audio Multifunction: Allows you to answer a call while simultaneously the voice prompt of GPS navigations or listening to music, achieve automatic switching mong mobile phone call, intercom and stereo music. Mobile phone call first, automatically switch to the previous status after hanging up. ★Noise reduction & super performance: Adopted DPS echo cancellation and noise suppression technology and HiFi speaker, make you enjoy crystal clear voice and stereo music with Bluetooth A2DP while driving at the high speed. Water-proof and Sun-proof button panel, very convenient and durable. ★Bluetooth 3.0 & FM radio: You can connect the phone / MP3 / GPS via wireless Bluetooth to listen to the music on the device, and the music can be controlled by AVRCP. Hand-free function and FM Radio make your driving intently and safely, enable your driving travel more wonderful.